Trump during last year's State of the Union. Shealah Craighead / Public Domain. Leading up to this address, Democrats took control of the House of Representatives after the 2018 election, and Trump faced criticism for the government shutdown. News anchors and political scientists, including Alvin Tillery, an associate professor of political science at Northwestern University, commented on the unusual political circumstances surrounding Trump's second annual address. Many female House Democrats, including Speaker House Nancy Pelosi, were dressed in white as homage to the women's suffrage movement. At one point during the address, they all stood and cheered when Trump mentioned women thriving in the economy, increased numbers of women in the workforce and – as seen in the chamber – the most women serving in Congress in history. Trump began his speech with an appeal for bipartisanship. “[My agenda] is not a republican agenda, not a Democrat agenda, but an American agenda,” Trump said. The president also praised his administration for the current state of the economy, taking credit for the creation of 5.3 million new jobs and a "historically low" unemployment rate. He also commended last year's the Republican tax plan. But these claims are over-exaggerated, Kellogg School of Management visiting associate professor Ben Harris said. But Trump's largest focus was border security, with the president calling it an “urgent national crisis” and demanding action to stop the supposed “ruthless coyotes, cartels, drug dealers, and human traffickers” entering the country illegally. Trump promised a wall and said that it would be “strategic, secure and see-through,” and he stuck to his usual rhetoric that walls save lives. In addition, the president took aim at the Muller and congressional investigations, blaming their supposed "ridiculous partisan investigators" for dividing the country. His most recent attack comes after news Monday that Trump’s inaugural team has been subpoenaed. In addition, a video released Wednesday shows Trump meeting with Russians in 1995 to discuss a building project in Moscow. The president has repeatedly claimed that he "had no deals in Russia." 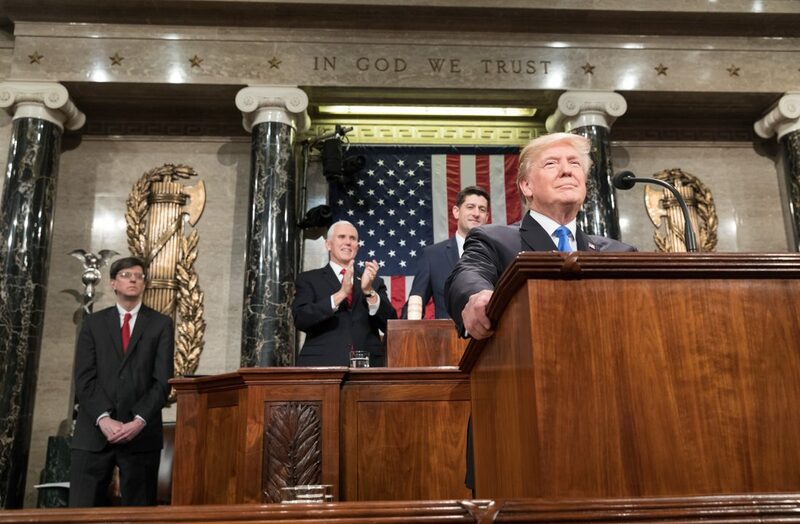 Typical to the State of the Union, Trump also recognized guests in the audience which included D-Day veterans, astronaut Buzz Aldrin, prison minister and nonviolent offender Alice Johnson, 9-year-old cancer survivor Grace Eline, Swat Officer Timothy Matson and Tree of Life massacre survivor Judah Samet. Following Trump's address, Democrat Stacey Abrams delivered the party's response. Abrams narrowly lost the Georgia's 2018 gubernatorial race to Republican Brian Kemp amid allegations of voter suppression. Her speech focused mainly on voting rights, with common themes of helping others, learning and being a community. “Together we are coming for America, a better America,” Abrams said, quoting her father.